The impact of sustainability can be addressed both in terms of the built environment and it’s effect on the day-to-day lives of the people who inhabit these design spaces. A healthy design should create a symbiotic relationship between the user and their environment. Designer Sarah Barnard’s holistic approach considers the psychological and emotional factors within a design to promote wellness. When choosing the basics, one should keep in mind the range of organic materials that offer health benefits. Sarah believes that eco-friendly and organic material selection are the basis for a healthy design. “Creating a restorative environment begins with sustainable choices. Even the smallest decisions matter and can have profound effects on our health and the environment.” Her holistic approach towards material selection includes raw fibers and natural textiles, such as wool, cotton and linen. This all natural (non-toxic) sofa is paired with a handmade, live edge coffee table featuring a collection of the homeowner's favorite things; agate slices, ammonites and an array of rose and lavender colored thistles. 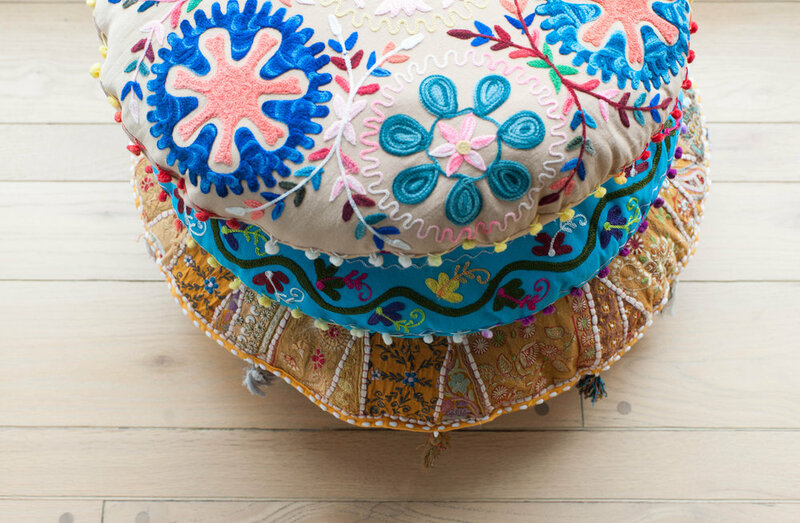 A collection of brightly colored floor cushions provides the perfect casual living room seating. Natural fibers like wool and linen are comfortable and healthy and can be organically dyed. Intricately hand carved sconces in American Walnut were designed by Sarah Barnard specifically for this home. Natural woods are another healthy material with an array of attributes that can become a defining focal point within your design. From stunning colors to unique knots and grain patterns, natural woods such as oak, walnut, and maple provide diverse utility and elemental beauty within a home. Sarah Barnard works closely with local artisans and craftsman to realize her custom furniture and lighting designs. This beautiful walnut dining table was custom made for the space from a single fallen tree. 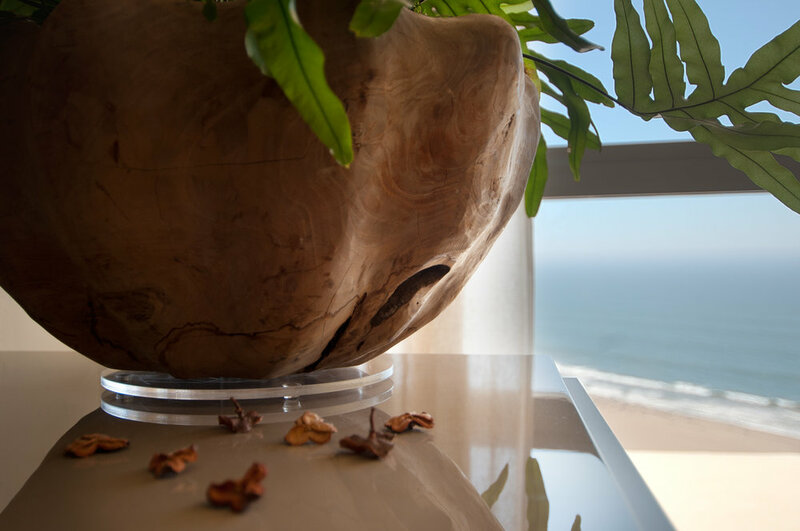 A key component of biophilic design is to incorporate natural elements within an artificial environment. We spend so much of our time indoors that the objects we surround ourselves with become very important. Recently, Sarah Barnard completed a sustainable penthouse on Ocean Avenue for an out of town couple with super meditative space requirements. Think total relaxation and harmony with the universe. Utilizing furniture and accessories as an expression of nature, Sarah’s custom designs bring the outdoors in. 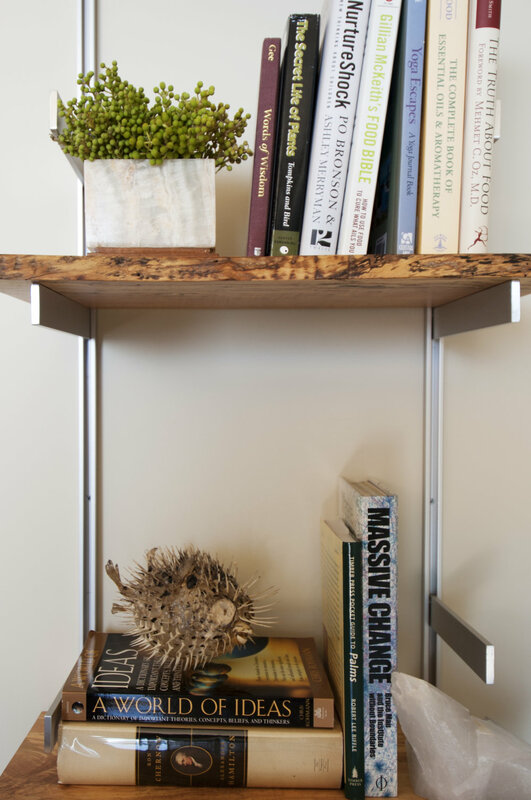 Elemental accents such as, stone, concrete, minerals, ceramics and plants create a sense of grounded balance. A custom concrete fireplace was designed by Sarah for this home. The subtle, etched lines reference the movement of water. The mantle displays specimens from the homeowner's collection of minerals. Delicate orbs are a soothing and repeated design element throughout the home. Sarah worked closely with a local artisan to realize her vision for custom designed wall sconces. This piece of functional art was hand-made from ceramic clay and fired in a kiln using traditional glazing processes. A handmade table with live wood edge feels close to nature drawing attention to its organic form. Large mineral specimens are displayed among collected shells and family photographs. Sarah believes it is important to surround yourself with things both meaningful and beautiful. "Live with what you love. Surround yourself with beauty and positive energy." Her design philosophy recognizes the importance of creating contemplative spaces which highlight her clients valued mementos and personal collections. Another gorgeous hand made wood table was made to fit perfectly within the foyer alcove providing a gentle, welcoming display of objects meant to inspire, protect and enlighten. The subtle sheen of the pale blue wallcovering references the nearby reflective sea and is accompanied by delicate coral inspired wall sconces.